Backpacker in training. I forgot the part about putting it on your back; I’m an awful mentor. 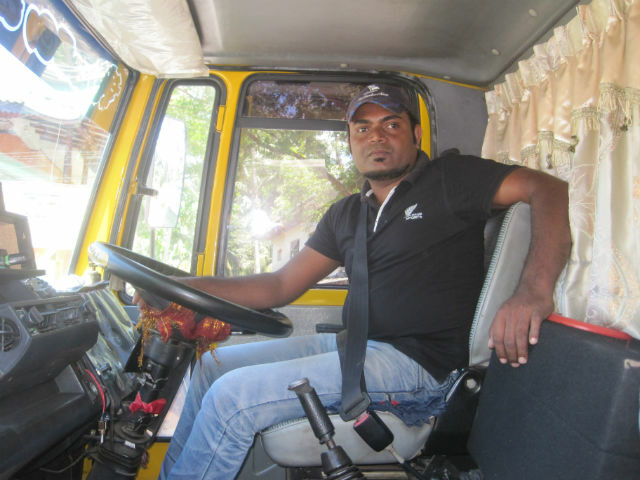 Sri Lankan buses have put me on the brink. It’s not them (so much), it’s me. I’m too tall. My backpack only fits next to the driver—if there’s space. At least the driver is communicative. 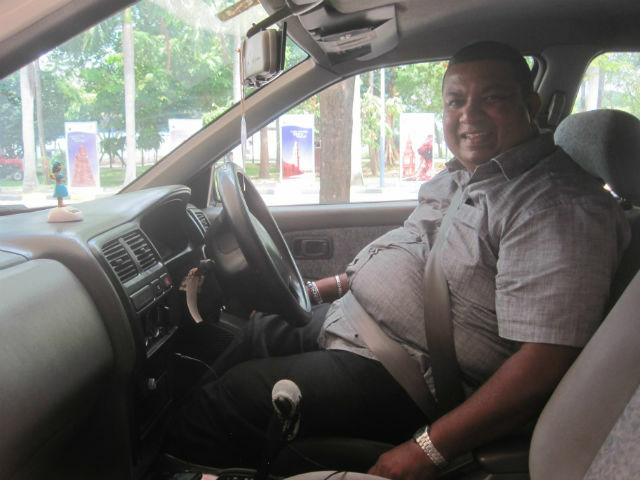 Sri Lanka has the advantage over India in that the bus drivers aren’t betel-nut buzzed crazies driving like there’s no tomorrow. Even if I wasn’t tall, dark and formerly handsome, I too-quickly tire of being jerked around by the constant starts and stops of a typical bus and its impossible-to-reconcile air horn. The bus is extremely cheap and the other 200 people on it are friendly without fail, but I decided to make a complete cut from public transportation and throw myself upon the hitchhiking gods. It was a rare, wise move. I descended from the highlands of Ella down to the southern coast of Sri Lanka, and it went so well that I made a semi-circle by continuing around and up past Colombo back to Negombo where I started this trip. 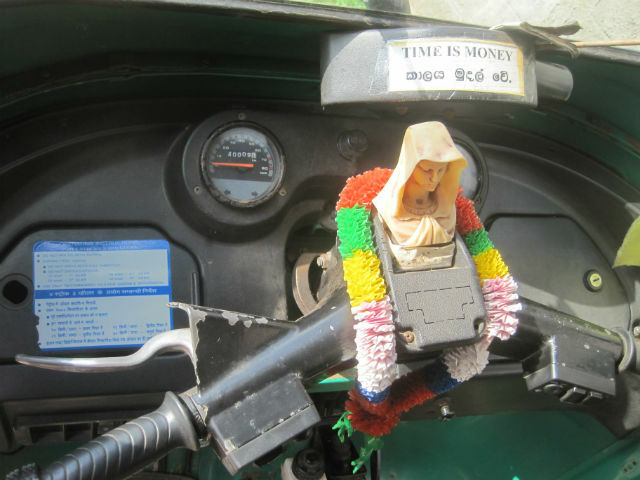 Seen on the inside of a tuk-tuk. I am a lonely hitchhiker. I want to be out in the middle of nowhere. I don’t like to be seen by anyone other than the drivers. It was an effective strategy since I hardly ever waited long to get a ride, but I spent more time walking away from town to quieter places than the act of hitchhiking itself. The fact that it was a viable option for me, a large, imposing backpacker of dubious hygiene (from a distance!) should make you consider it. Like in most countries, hitchhiking helps accelerate the process of getting to know a place just from the wide variety of people who pick you up. 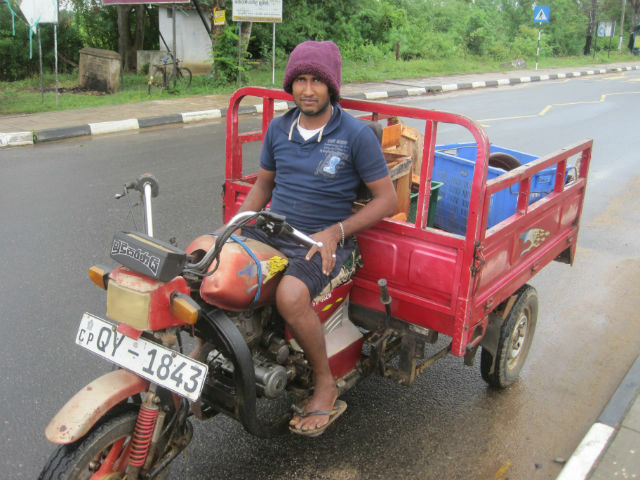 In my case the highlights were Mr. Purple Hat below, a couple of Sri Lankan Telecom guys who gave me a ride of no more than 500 meters but they were so eager to help, and a guy whose job it was to drive around Iranians working at a local power plant that they had invested in. Whatever you would call this vehicle, it was a first. I didn’t even put my hand out and he stopped to offer a ride. I almost turned him down because I was in a wetland area that was so peaceful and pretty, but there weren’t a whole lot of cars, beggars can’t be choosers, the purple hat, etc. I believe this was driver #8 out of 11 from Ella to Tangalle, which is 145km. I took any driver for any distance. The sea at Tangalle is a titch cooler than any other place I was in Sri Lanka. A smidge. A teense. The beach is dirtier and you wish the water was less opaque, but there are less people, the ocean is fun to swim in, and the non-touristiness was a relief. 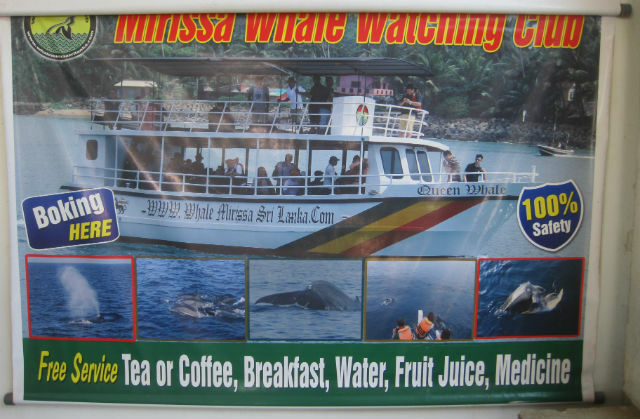 Some people rave about Mirissa, and I can picture it if you fall in with the right bunch of people, but I like having a real town nearby, not having every single business dedicated to tourists. Weligama, the next town west, had good-looking smooth waves and a town, but the main road goes too close to the beach. There has to be some hidden-away Shangri-la nearby. I have to eat crow about Sri Lanka having made no changes to its infrastructure in the 15 years since I was here. There is a new highway running from Matara in the far south up to near Colombo. Strangely few people are on it, likely because of the price of tolls (aka Japan Syndrome.) 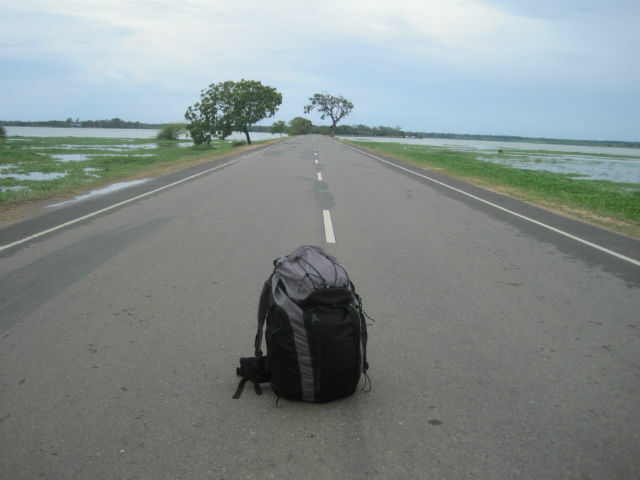 It’s a godsend for hitchhikers, though it ends in a distant suburb of Colombo. Somehow I got a miracle ride from where the highway ends up to Negombo, which is like hitching completely through Los Angeles in one ride. Major score. This was only the second time a dumptruck picked me up. The first was the day before. 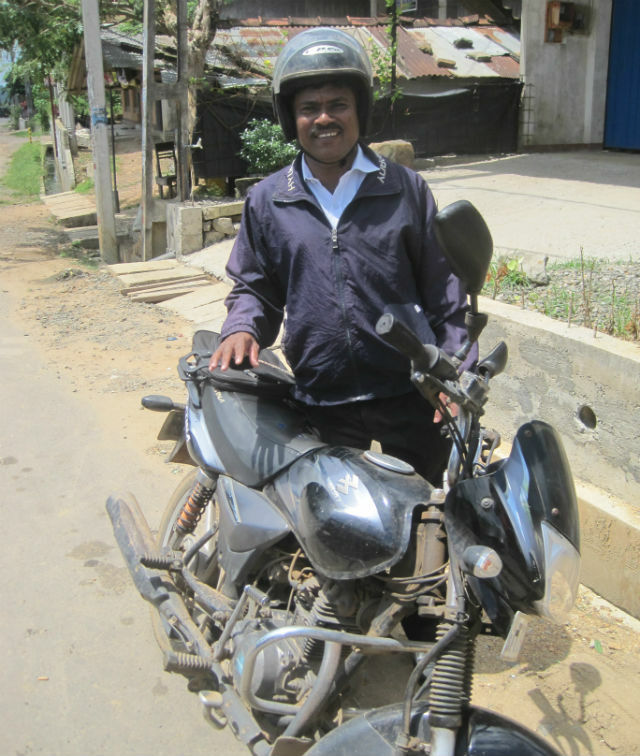 A high school principal gave me a ride from the edge of Weligama to the highway entrance. Reread that sentence. that’s how cool Sri Lanka is. I got an embarrassingly short ride to the airport (because I knew how close I was) with this man. 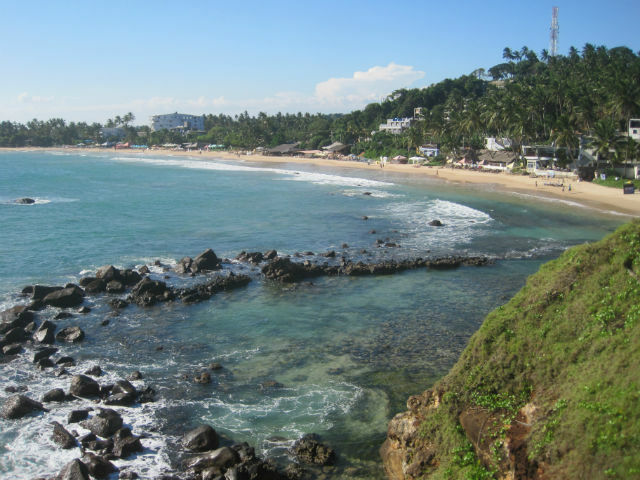 In Tangalle I stayed in Sun Sea (tel 0713051090) near the beach and town, only 1000 rupees. Relaxing to hear the waves at night. Less relaxing to wave away hordes of mosquitoes while on the toilet. I was at Moon Glow Guest House in Mirissa (tel 0773955172), but just after I agreed to stay, two Germans came to tell me that they were robbed two nights before. They said it was their fault, that they slept with the door open for ventilation, but they were on the second floor of a room not facing the street and the thieves rustled around until they found what they wanted. Could it have been an inside job? The Germans trusted the family enough to give them their key while they were out, which is something I never do unless they insist. I lock my backpack around the fan cord in situations like this. Maybe the fact that they slept well enough to be robbed is testament to the quality of the mattresses at Moon Glow. 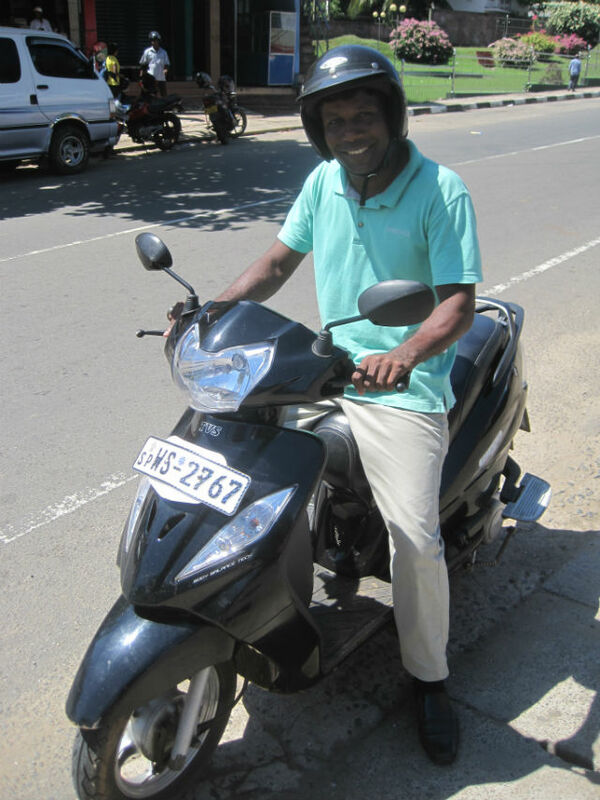 In Negombo I decided to stay on the northern end of town. I found a nice-looking place and used the old ruse of saying to the manager that it looks like too nice of a place for me to stay, which it was, but they had one simple room on the top floor for only 1000 rupees. Shanith Guest House, No 8/A Kottuwa Road, Ettukala, Negombo (0312237453). There is a type of fat banana here, the fattest banana I’ve ever seen, a fantastic creamy thing called Kolikuttu. The red bananas are also delicious. We Americans need to get over our Cavendish obsession. 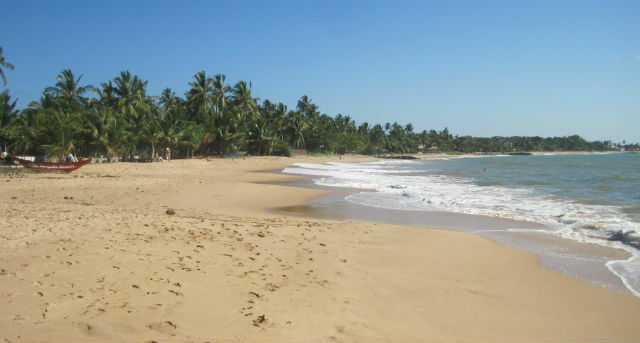 Sri Lanka doesn’t get enough tourist love, this forgotten teardrop of an island off the southeastern coast of India. It is a surprisingly cheap place to get to with the likes of flydubai, AirAsia and Air Arabia. I didn’t realize until I ran around for two weeks that I hardly scratched the surface of everything that I’d like to have done. Travelers, you don’t have an excuse to pass on it, and, no, I didn’t get sick from the food once. Want to know a hot tip? Instead of taking two crowded public buses to get to the airport from Negombo Beach, take the train. 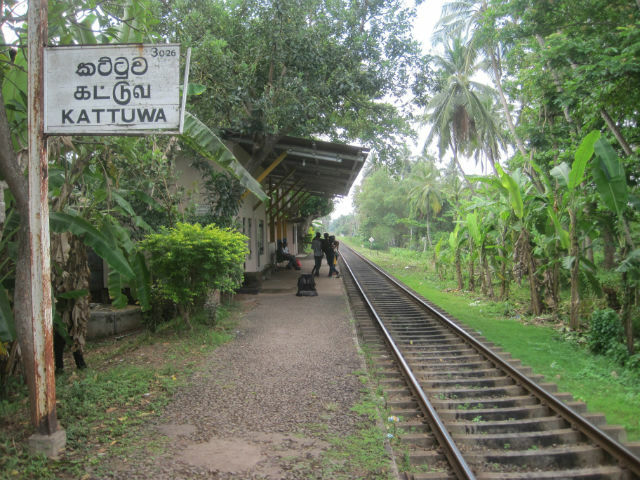 Go from Kottuwa Station down to Katunayake South (it continues on to Fort Station in Colombo) and the airport is about 2km east of the overpass. You can catch a quick bus to just before the airport and/or hitchhike the last bit. Piece of cake, trust me. 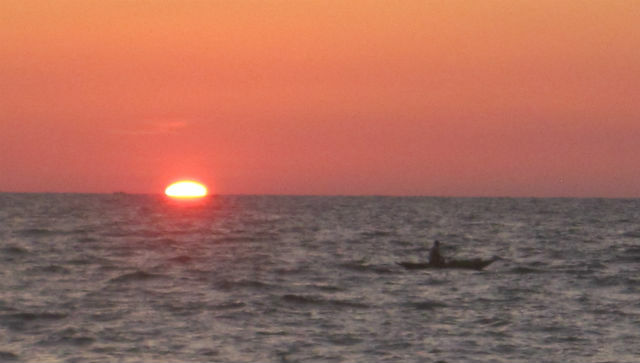 Sri Lankan sunsets never fail. Thanks for the tip about the train to the airport, it will be filed away for a potential trip next year. I love the fact that you hitchhike, it is a lost art and while some people are afraid, I always just remember the line from Spaceballs where Mel Brooks says for them to comb the desert, and just assume my “ship” will come in eventually. They actually say that hitchhiking is more safe than driving yourself, especially if you are a drinker. Do you hitchhike, too? More power to you for being a woman! (Hmm, but there was a male basketball player named Gail, so maybe I shouldn’t assume.) Anyway, I hope you have a good time in Sri Lanka. I enjoyed it more than I expected. 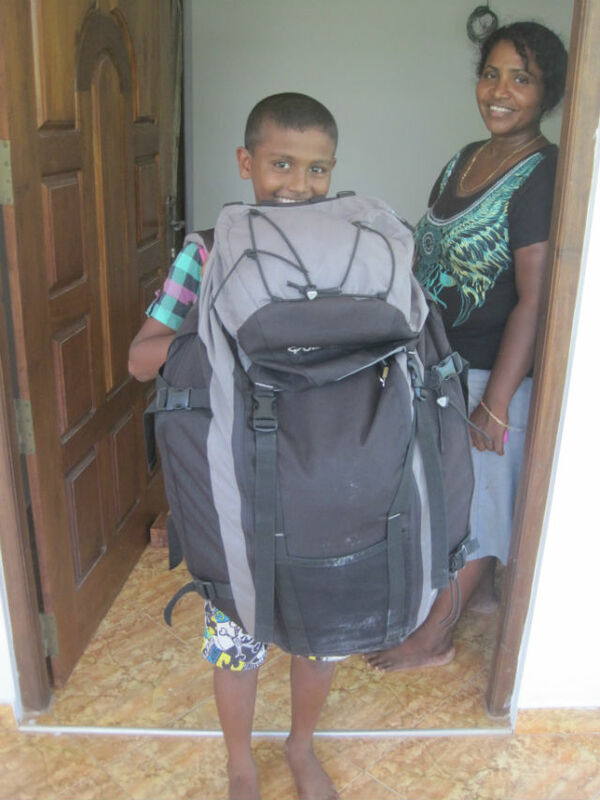 We are also hitching, but did not know what to expect in Sri Lanka. Hi, I'm Kent, and dromomania is defined as "an uncontrollable urge to wander", which means that after 100+ countries I'm still very sick! Check my About Me page to see if I am contagious.